The exhibition reimagined/reinterpreted a former exhibition by American artists Renée Green and Sam Durant: Making History, 1999 curated by Jennifer Dunlop in the same galleryspace at CCS Bard, Annandale on Hudson, NY. As an example of the breakdown of social systems, both artists reference Kent State Ohio in 1970, where National Guardsmen shot at students protesting the US invasion of Cambodia during the Vietnam War. »In Not Again Andrea van der Straeten has combined her formal study of a handful of archived installation shots with readings of poems by Walt Whitman and the women in the Weather Underground Organization. Subjective description and interpretation supplement the prosaics of the archive. Van der Straeten predominantly focused on Sam Durant’s pieces featured in Making History. Her research into the culture of revolution of the late 60s and 70s in the US echoes some of the concerns of Making History but foregrounds an analysis of language, especially "scatological rhetoric", a form of dissensual public speech. 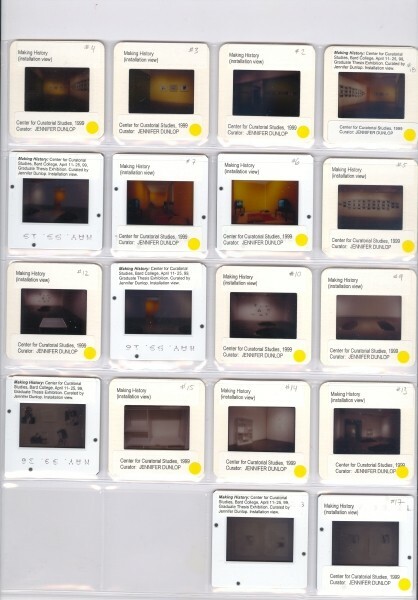 The beginning: 18 installation shots, a press release, a gallery leaflet. These remainders of Making History, a 1999 CCS exhibition, are the backbone of Andrea van der Straeten’s unusual inquiry into a past show’s propositions. Her 2010 tweaked reinterpretation emerges out of conversations and collaborative research with the curator, eager to know and use what came before. Not Again takes place in the same gallery space but appears as an echo and functions as cabinet of interpretations. Immersing themselves in the aural and textual situation, visitors will meander in between past and present exhibitions. Not Again suggests repetition, but refuses exact reproduction. Instead, it heightens ephemerality and explores the differences in subjective memory, interpretation and observation. Andrea van der Straeten’s encounter with the archived documents and her ensuing readings brought about new works on paper, site-specific wall drawings, as well as sculptural interventions. Not Again riffs off the spatial distribution in the original exhibition. Van der Straeten also associates the show’s historical references, the Kent State Ohio shootings and social upheavals of the late 1960s, with literary texts from other historical periods. As a whole, her work interrupts linear patterns of history making and focuses on recurring idioms in political rhetoric.